Miley Cyrus doesn’t mind being single these days … because music is her sweetheart. “I need to treat my music like a relationship – give it my time and all the attention it deserves – that’s my main love right now,” the singer, 20, tells December’s Cosmopolitan, on sale Nov. 5. “This is the best time of my life. I’m not going to look back on it and be like, ‘I wish I hadn’t been dwelling over a breakup,’ you know?” she says of her split with Liam Hemsworth. And Cyrus is finding support from fellow musicians Kanye West and Katy Perry, whom she says can understand her experience when very few can. “The support of other artists is important because there are not many people who can relate to what I’m going through right now. Kanye West is one of those people, and even Katy Perry has been so cool,” she says. “It’s easy for Kanye to support me because we’re totally separate lanes of competition, but for Katy to say that she appreciates what I’m really doing for the pop industry, that keeps you going. And I mean, who cares what the media buzz is if Kanye West is telling you that you’re the s—? “Even people who want to hate on me, they can’t even shut down the fact that I’m literally what everyone is talking about,” Cyrus says. Giuliana Rancic: What’s On My DVR? Currently filming their reality show, Giuliana & Bill, the couple will have the chance to relive their favorite past show moments when season 6 begins airing in full on the E! Network starting Tues., Oct. 15 at 10 p.m. (EST). PHOTOS: Remember this hilarious Giuliana & Bill scene? 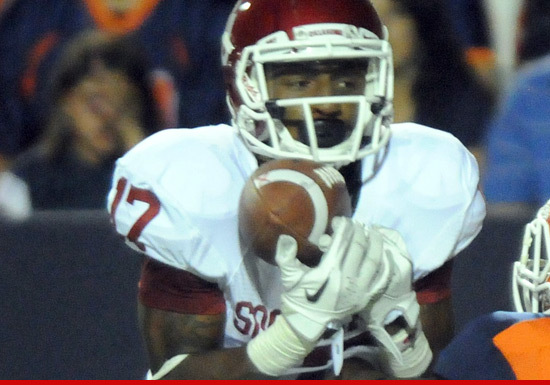 Oklahoma Sooners wide receiver Trey Metoyer has a problem — he can’t stop masturbating in public … this according to police docs obtained by TMZ. The sophomore — who was a 5-star recruit out of high school — was charged with 2 counts of felony indecent exposure after allegedly throwing a J in public on 2 separate occasions. 8/29/13 — Someone called police in Norman, OK to report a man wearing a blue shirt and blue pants pleasuring himself inside of a red Pontiac Grand Am. We’re guessing she declined his offer. 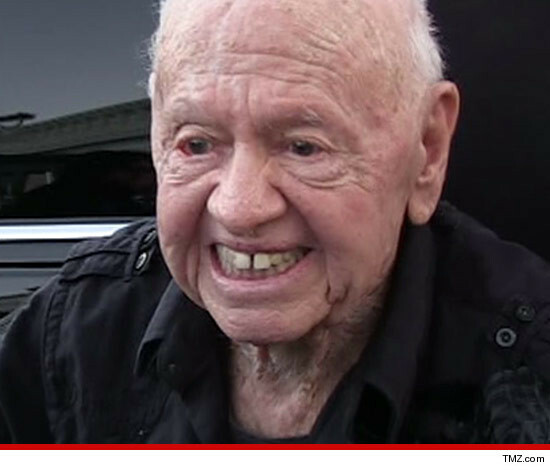 Mickey Rooney‘s stepson now concedes he owes the famed actor $2.8 million for allegedly siphoning off a ton of money from Mickey’s financial accounts, but there’s a GIGANTIC catch. Christopher Aber and his wife, Christina, have just settled with Mickey’s conservators, after allegations they played funny with Mickey’s money. There were also allegations the couple deprived Mickey of food, meds, and even blocked him from leaving his home. The whole thing escalated when the 93-year-old actor testified before Congress on elder abuse. So now Christopher and Christina — who have declared bankruptcy — have folded. So how, you ask, can Mickey get $2.8 mil? Well under the settlement, Christopher and Christina have a homeowner’s insurance policy that arguably covers this type of wrongdoing. So Mickey’s lawyers think they can use the settlement to go after the insurance company and get their dough. Here’s the rub. The insurance company has already made it clear … it’s not paying anything because the alleged abuses were intentional, and that’s not covered under the policy. So Mickey’s lawyers are now going to sue the insurance company and demand not only the $2.8 mil but also punitive damages for bad faith denial of coverage. Kaley and Briana Cuoco are one classy sister act. The Big Bang Theory actress, 27, and her younger sibling and personal assistant — a contestant on the new season of The Voice — are the talk of the town in Hollywood these days, and it’s not hard to see why. Briana, for her part, is equally effusive about Kaley — though she admits there are some challenges in having a famous sister. In a conference call with reporters, she said people assume she has “an in” just because Kaley is “successful in one field in the business.” But that’s not necessarily the case. “People open doors all the time for people…but you have to be the one to close them, no matter what,” she explained. Joseph Gordon-Levitt to reprise his role in the next Batman flick? Not so fast! While promoting his latest film Don Jon on The Tonight Show with Jay Leno, the 32-year-old actor admitted he probably won’t be Ben Affleck’s wingman in the next series. Gordon-Levitt starred alongside Christian Bale in The Dark Knight Rises in 2012 and (spoiler alert!) it was revealed in the last few minutes of the Christopher Nolan film that his character’s real name was Robin, the caped crusader’s famed right-hand-man. As Bale’s Batman later walked away from the infamous cape, Gordon-Levitt’s character is then given the tools to begin training in order to take over as Gotham City’s hero. Though the Looper star doesn’t think he will be reprising his role, he thinks Affleck, 41, is “going to be great” as the DC Comics character. In late August, Warner Bros. revealed that Affleck was cast to play Batman opposite Henry Cavill’s Superman in the Man of Steel sequel. A source told Us Weekly at the time that the father of three had begun working out two hours a day in order to transform his physique for the iconic role. Big Brother Season 15 has crowned its winner. After spending 90 days in a house together on the CBS reality show, GinaMarie Zimmerman, Spencer Clawson and Andy Herren made it down to the final three contestants. After competing in a three-part Head of Household competition, Zimmerman won the first round and Herren won the second and third. As the winner, Herren chose Zimmerman to join him as the final two contestants. In a 7-2 vote, Herren took home the $500,000 prize, while Zimmerman walked away with $50,000. Tell Us: Are you happy with the Season 15 Big Brother winner?